An important feature of Harmony Paint is the Preferences panel. From here you can customize your interface, tool behaviour and shortcuts. Throughout this guide, you are often required to go to the Preferences panel to set parameters and options. ‣ In the top menu, select Edit > Preferences (Windows/Linux) or Stage > Preferences (Mac OS X). The [Ctrl] + [U] (Windows/Linux) or [⌘] + [U] (Mac OS X). Some preferences require you to exit and restart the application or to close a view and reopen it. To speed up your work, all of Harmony Paint’s keyboard shortcuts can be customized and you can even choose other software keyboard shortcut sets. Refer to the following sections in the Harmony Stage User Guide. Use the General tab to set general software behaviour and user interface. When this option is enabled, the Palettes Lists will be save when saving your work with the Save command. 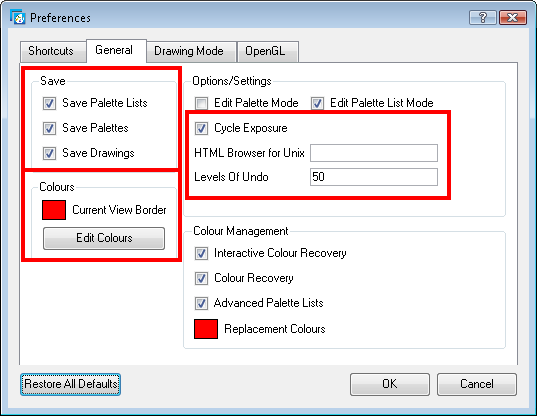 Disabling this option prevents the Palette Lists from being saved without specifically using the Save Palette Lists command from the Colour view. When this option is enabled, the Palettes will be save when saving your work with the Save command. Disabling this option prevents the Palettes from being saved without specifically using the Save Palette command from the Colour view. When this option is enabled, the drawings will be save when saving your work with the Save command. Disabling this option prevents the drawings from being saved. This option makes the navigation wrap-around from the last cell or column to the first. This option is used to view the online help on Linux machines. Enter the command to launch the browser, including the path if necessary. The Levels Of Undo preference determines the number of actions retained by the Undo List. By default, the system stores 50 actions in the list. You can alter the number if you want to. The Colours preference allows you to modify the colours of the different User Interface views and elements. For example, you can change the Drawing view’s background colour from white to any other colour. This can be useful to easily and quickly distinguish details that are painted white which would not show on a white background, for example a character’s white eyeballs. Altering these preferences require you to restart the application or to close a view and reopen it for the modifications to be applied. 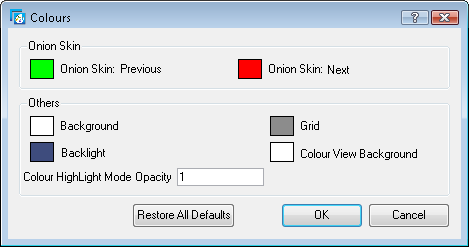 Changes the colour display of the next drawing when using the Onion Skin feature. Changes the colour display of the previous drawing when using the Onion Skin feature. Changes the background colour of the Drawing and Model view. Changes the display colour of the Backlight option. Changes the display colour of the grid when using the Show Grid option. Changes the background colour of the colour list area of the Colour view. Changes the opacity value of the washed out art when using the Highlight Selected Colour option.